“Male Rabbit for Stud” – Should your hire out your bucks? I just want to talk about the issues involved in breeding outside your own herd. It may sound simple enough at first glance, but it is deceptive. And I’m afraid too many friendships have been damaged by a joint breeding or a stud situation gone sour. You breed your buck to someone else’s doe and you get money. We’re done. Right? Well, not exactly. Let’s back up quite a bit and start at the beginning. First, you have to decide what to charge for your stud fee. There are many different philosophies out there, I’m sure. I am governed by a strong desire that people are satisfied with their purchases from me. So I get a little crazy when I breed a doe for a fee. I worry that the buyer will not get something worthwhile for their money. I know they are taking a risk – and they should know it, too. But even with this knowledge upfront, they could go away feeling dissatisfied. I no longer breed does for other people for fees – just because I worry myself to death over it. I used to charge $50 per breeding by my grand champion bucks, but only to does I sold. But I charged only $20 if there was but one kit and $40 for two kits. So I shared some of the risk that way. There’s also the question of when you collect your fee. If your motivation is strictly monetary and business, then you collect it when the breeding occurs and let fate take over from there. You might choose to wait until the doe has a live litter from the breeding. I collected my fee when the kits were a few weeks old. I didn’t want someone paying for babies that only lived a few days. Another option is to guarantee a rebreeding, should the doe miss. You should discuss ahead of time whether that includes the doe having a dead litter or a litter full of peanuts. I have participated in several joint breeding projects with friends. These have all turned out to be just fine. We’ve had no problems that I’m aware of. I think that the main reason is that we’re very clear upfront about who gets what in the litter – before the breeding takes place. I recently agreed to a breeding but did not clarify who got what. The doe wasn’t interested, but I realized later that I hadn’t followed my own rules. Of course, I don’t enter into these types of agreements with people I don’t trust, so I’m sure we would have worked things out well and done so before any kits were born, but it just shows how easy it is to get busy and forget this important step. There’s no one way to do a joint breeding. 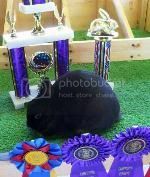 One approach is to give the first pick of the litter to the owner of the most outstanding rabbit. For example, if I got to breed one of my does to a BOB from a Convention or Nationals, I would expect to give the first pick of the litter back to the owner of the BOB. I would just count myself lucky to get those genes in my barn. Another approach is to give the first pick to the owner of the doe. That person does much more work and takes a bigger risk. I’ve never heard of a buck to die from breeding, but does can. Occasionally, I’ve agreed to give the owner of the buck the best doe (whether it is the best of the litter or not) and I would take the best buck. That’s a nice way to go since, if I already have the doe in the deal, I might be in the market for a buck, and vice versa. Of course, there’s a risk that there will be no does or no bucks. Make sure you have a back-up plan that you have discussed. Also, think ahead of time about what you will do if there is only one kit. When that happens with me, I always say the single kit goes to the owner of the doe. Although I have had a few litters with more than one show rabbit in it, usually getting more than one really good rabbit in a litter is the exception. And you both want a really good rabbit out of the deal, right? So one solution is to have a multiple breeding plan. My friend Alison and I have done this in the past. We agree that the owner of the doe gets the pick of the litter the first time. Then we rebreed and the owner of the buck gets the pick of the litter the second time. Also talk about when you will pick your rabbits. I don’t like to even look at a Holland until they are 12 to 14 weeks old. Others want their rabbits sorted out by 8 weeks. You don’t want to think that everything is going smoothly only to find that the other person wants to drag their feet about making a selection or pressure you into choosing before you think the rabbits are ready to be sorted. Whose name goes on the pedigree? You can do the joint name method. It can be long and cumbersome, depending on the prefixes involved, but it does give credit where it is due. If you buy a doe from a breeder that is bred to a buck of his/her choosing, then that breeder has the right to pedigree the resulting rabbits. They may give up that right, but you should ask and find out their preference. 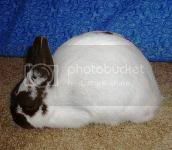 When I used to sell rabbits bred, I would allow the new owners to pedigree the kits. It wasn’t being nice. They might pedigree an ugly rabbit, and I didn’t want my name on it!!!! I did recently sell a bred doe to a youth friend of mine. I didn’t do the breeding for him, but rather, had bred the doe for myself but decided to sell her. I gave him the option of pedigreeing them or of my pedigreeing them for him. I hope he doesn’t want to keep any ugly rabbits!!! 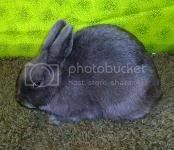 With joint breedings, I generally pedigree the rabbits I keep and my friend will pedigree the rabbits she keeps. Whether you are collecting stud fees or working together in joint breedings, it is very important that you have a clear agreement with the owner of the other rabbit. It’s a great idea to have the agreement in writing. A month or two or three down the road, it may be difficult for even you to remember what you said. Never enter into an agreement with someone you do not trust. Always be totally honest about what is born out of a joint litter or from a stud situation if the fee is not collected upfront. Follow your agreements for pedigreeing the resulting rabbits. Health is a huge issue. Do not be shy about checking the other person’s rabbit and insist that they check yours. Be very picky about who you enter into joint projects with. Be willing to accept that the deal may work out better for the other person than it does for you. I try to forget about breedings from my bucks. Then when friends bring me bunnies back, it’s like a surprise present. So, to sum up, agree on the fee, if any, and when it is paid. Know who gets what before the kits are born. Discuss how the kits will be pedigreed. Make health inspections part of the breeding and insist that the other person inspect your rabbit. Be honest about what is born and stick to your end of the bargain. Be willing to accept that the other person may get more out of this than you. Enter into your agreements with a spirit of generosity And have fun.